The Shepherd’s Market is a client-choice food pantry serving the hungry and needy in south Baton Rouge. The pantry is open every Monday from 3 p.m. to 6 p.m. and every Tuesday and Thursday from 8 a.m. to 11 a.m. Doors to the pantry open one hour prior to each shift. We have been operating for six years. In that time we’ve opened more than 2,700 unduplicated files, each representing a different family. We serve 380 families per month and distribute 23,000 pounds of food per month. The Shepherd’s Market serves 35 families per day, or 400 families per month. Our focus area includes zip codes 70808, 70809, 70810 and 70820, but we serve any family in need. 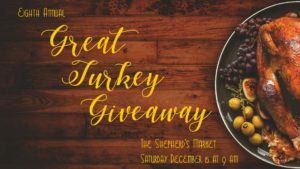 Our eighth annual Great Turkey Giveaway was Saturday December 15, 2018. We provided 570 turkeys and all the trimmings for wonderful Christmas dinners. See pictures of our amazing volunteers in action! Donations can be made through our PayPal – note Great Turkey Giveaway. Read about a research project The Shepherd’s Market will soon be part of with LSU’s Pennington Biomedical Research Center in Baton Rouge Christian Life magazine.